Revealed : details of the €129m annual State property bill – what, how much paid and to whom. The Sunday Independent reported two days ago on the State’s €129m annual property rent bill. This entry links to the full list (available here, courtesy of the Office of Public Works) and looks at the income of NAMA developers. The list itself is of spending by various government departments – it excludes spending by state companies and agencies, you won’t find the NTMA or NAMA rent bill forTreasuryBuilding on the list. The list itself is well worth reading. 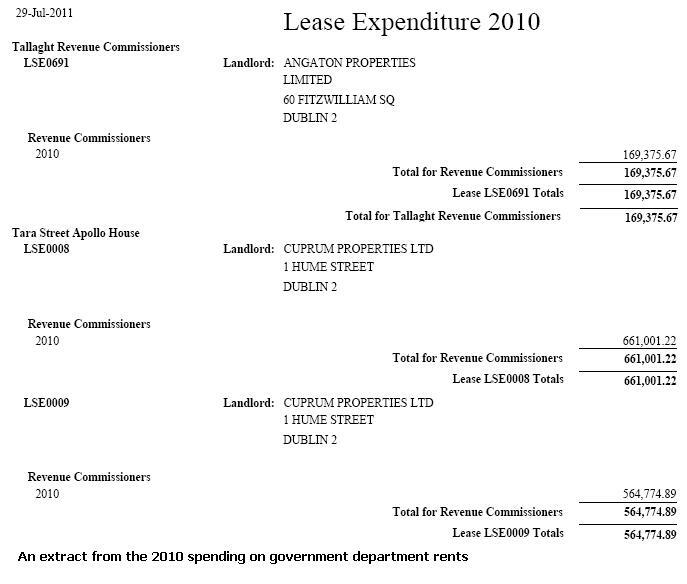 It is truly amazing how much property is leased by government departments and the range of landlords is also impressive ranging from insurance giants, unions, religious orders, the Duke of Leinster, NAMA developers, a few politically-connected individuals, the Criminal Assets Bureau and what appear to be ordinary individuals – you might be surprised at the identity of some of the landlords, I was. NAMA has said in the past that it will move to control rent rolls where developers are in default. Again, the full list is available here.